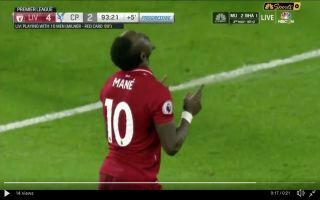 In the 93rd minute of Liverpool’s clash with Crystal Palace, explosive winger Sadio Mane scored Liverpool’s fourth of the day after a wonderful run. Scotsman Andy Robertson continued to show the world his tenacity by battling to keep the ball in play, which left Mane free to run at Palace’s goal. Mane managed to catch the defence while they were half asleep and the Senegal star had enough time to pick his spot and calmly slide the ball into the back of the net. Liverpool didn’t make it easy for themselves this afternoon but they came away with the win which is the most important thing at this stage of the season. Jurgen Klopp’s men are now seven points clear at the top, title rivals Manchester City will face off against managerless Huddersfield Town tomorrow afternoon.